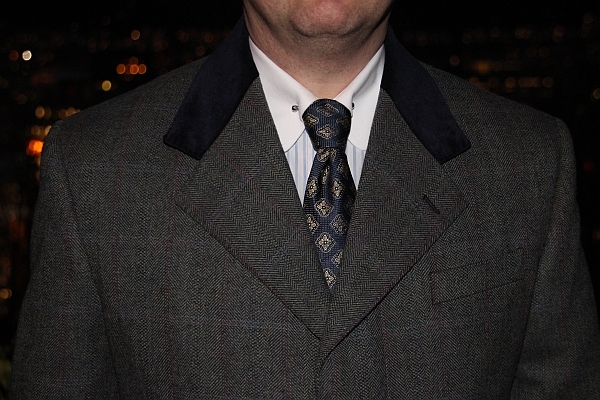 A couple of months ago I wrote about a new overcoat I was having made (you can read part 1 here). The overcoat is now finished, so it's only natural that I present to you my new overcoat with which I'm rather satisfied and, I'm pleased to say, I've been well complimented. Since I said pretty much what I wanted to say about the fabric and the tailor in the first post in this mini series, this post will mainly contain photos showing off the overcoat in all it's glory. Enjoy! with tweed from Hunters of Brora. Slanted pockets with navy velvet detailing. the colour (the photo part 1 is more accurate).